Recently I saw a post on social media reminding people that as spring comes on strong, so do snakes. The post offered visual proof (see above) of this, in the form of a healthy, four-foot long Western diamondback rattlesnake, lounging next to a footpath along the American River near Sacramento. Like many folks, I suspect, I regard snakes with a primordial mixture of revulsion and admiration. I respect their ecological role but have never been a big fan of doing anything with or to them—other than staying the heck away. This photo got me thinking about close encounters I have had with snakes over the years, while fishing. There was the time my brother and I were fishing with my grandfather in his boat in one of the mangrove channels off of Captiva Island in Florida. We were prospecting for snook, casting shrimp tails up against the mangroves from close range. Suddenly a dark, lithe shape slid out of the tangle of roots and began to make a little V in the water. There was the time I was fishing a stretch of public water on the Little Popo Agie River near Lander, Wyoming one summer afternoon. As I made my way down the steep footpath from the parking area, I came around a corner to find a thick ribbon of snakeskin spanning the rough path. I thought, better pay extra attention today. I waded across the stream and made my way carefully through the dense grass that grew waist-high right to the edge of the bank. That extra attention translated to hypervigilance, straining to discern if every rustle were in fact the initial lazy shakes of a fat rattler within strike range. Just prior to the commotion on the Little Pop Agie River. At length I made it to a pile of driftwood, from which I worked a nymph rig through a tasty slot and landed a couple of decent brown trout. About that time a pair of other anglers appeared on the opposite bank, one of them packing a large sidearm. He patted it and said, “Snake loads. Heard there were a lot of rattlers in here recently.” Then he and his partner plowed off through the grass to the far side of an oxbow. It wasn’t long before I heard yells, then several shots in rapid succession. My disquiet was not improved by this report. After another half-hour or so of constantly scanning the ground around my feet, I decided I had done enough fishing at that spot. I made my way on tenterhooks back downstream to the place where I had forded, relieved to have no reptilian run-ins in doing so. I was about halfway up the footpath on my way back to the truck when there were more yells, and three more shots echoed against the sandstone crags looming above the stream. There was the time I took my young son and one of his friends fishing on the lower Tuolumne River, where it rumbles out of the foothills into California’s Central Valley below LaGrange Dam. They were 11 or 12 years old and it was a week or two into spring. I had given my son his first pair of waders and wading boots the previous Christmas, and his friend was similarly outfitted. We donned our gear and began the short hike to an area upstream where there was good bank access and room to spread out. This is snaky country. There are rock outcrops everywhere, their bases rife with burrows of various rodents. Long stalks of wild oats grow thickly here, along with mazes of blackberry. As we dropped off the gravel access road into the floodplain, I instructed the lads to be vigilant about rattlesnakes. They could be out sunning themselves among the rocks. 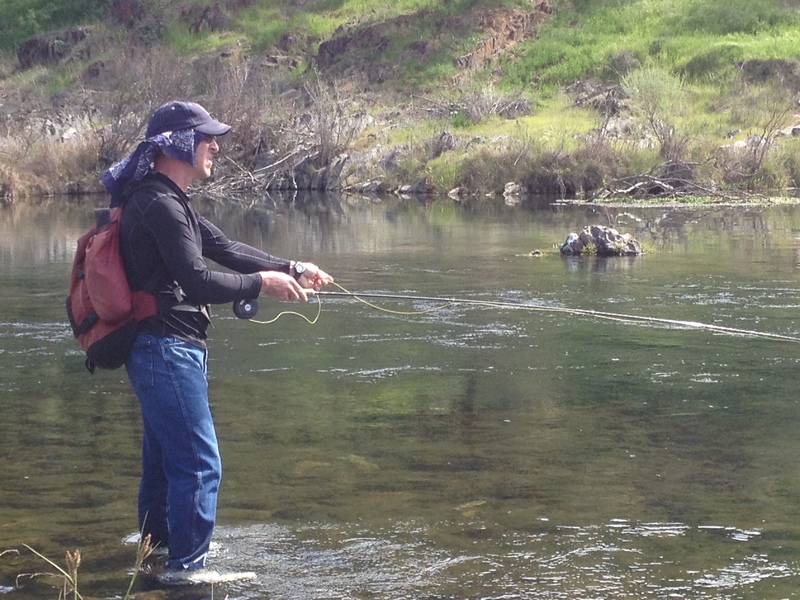 My brother fishing the lower Tuolumne River, near the site of the snake incident. We got to the bank of the stream without incident. Just upstream the bank becomes a series of rock ribs, lying at or near the water line. I decided we should move up there to check the head of a nice run. To get there we had to traverse channels filled with cobbles and sand between the ribs of rock. I stepped down into one of them. My son was standing on one of the ribs, and in his youthful exuberance he elected to jump rather than step down from that rib into the channel. 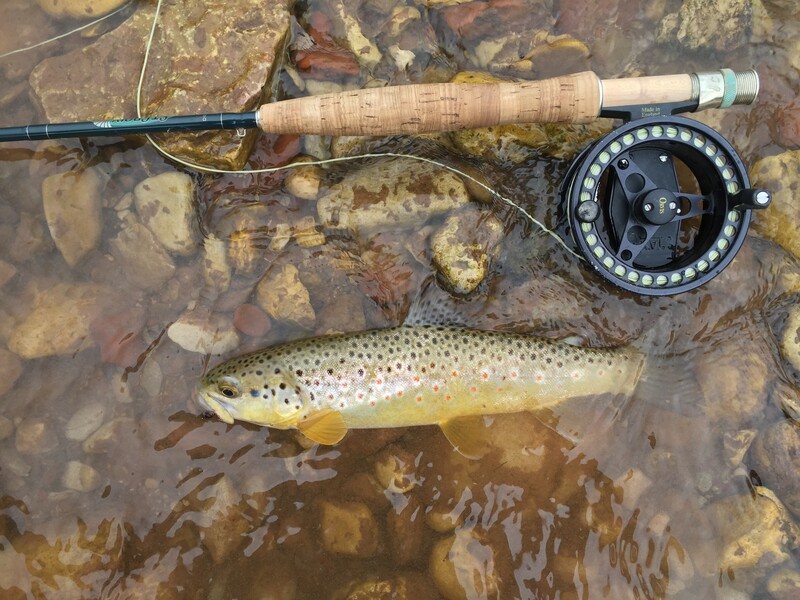 As he jumped off the rib, a pale brown dart slashed out of a crevice in the rock below him, coming within inches of his waders. The little dart made no sound, either as it struck or as it recoiled into the crevice. I quickly pulled my son a safe distance away. After a moment, we were able to discern a perfectly camouflaged juvenile rattlesnake wedged in the slot in the rock. It shook its single rattle slightly, almost inaudible against the murmur of the river. I was surprisingly unperturbed by the encounter. In the end, no one got hurt and it was a “teachable moment,” as we used to say in the outdoor education world. It was only later that evening, when recounting the adventure to the friend’s parents and seeing their eyes widen, that it struck me as having been serious enough to call into question my judgment—as a fishing guide and parental influence. I have had numerous other encounters with snakes in the outdoors—garter snakes tracing squiggles in creeks, somnolent rattlers in the early morning in the central Wyoming sage, managing to stay in the saddle as a Western diamondback as big as my arm blasted apart the silence from its brushy hideout. And based on my experience I’d say that when fishing you are far more likely to require medical treatment for an ankle rolled on snotty cobbles, a fly embedded in your ear, or 2nd degree sunburn than for snakebite. So there’s no reason not to venture out among the serpents this spring. As with so many other things in life, you just need to watch your step. Sam Davidson is TU's communications director for California and Oregon. He says if you really want to experience snake terror, tramp through the Australian outback for a week -- you'll never see, or hear, the many varietes of deadly snakes there coming for you.